Regarded as a literary and political rebel, Kahlil Gibran's work-essays, stories, parables, prose and poems-has touched the hearts of millions. He wrote about love, marriage, friendship, pleasure, sorrow, crime, work and law in a simple, spiritual manner and has influenced people all over the world with his wisdom for decades. This collection includes some of his most famous works like, The Prophet, a series of philosophical essays which has long attained cult status; The Madman, where Gibran talks about madness; A Tear and a Smile, which discusses why joy and sadness are required in equal measures in one's life; and many more. 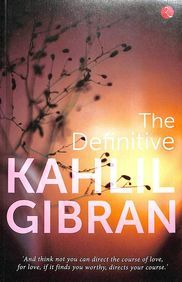 Encompassing the writings of one of the most profound and influential authors of the twentieth century, The Definitive Kahlil Gibran provides relevant answers to all of life's questions and opens a new and mystical world for readers to explore.